Botanical carnivory is just one of many ways in which plants have adapted to cope with low levels of nutrients in the soil. Carnivorous plants have evolved specialised leaves, called traps, for prey attraction, capture and digestion. The traps are usually less effective in photosynthesis, but extremely effective in obtaining nutrients the captured prey – a rich source of nutrients, which can later stimulate photosynthesis in the whole plant. Research recently published in New Phytologist reveals the origin of the Venus flytrap’s snap. The Venus flytrap has evolved modified bilobed halves of leaves with sensitive trigger hairs, called trichomes. Stimulate these trigger hairs twice and two electrical signals (action potentials) are generated. The trap rapidly snaps shut. This sequence of events after prey capture resembles a well-known plant defence signalling pathway in response to pathogen or herbivore attack. After being wounded, ordinary plants generate electrical signals and accumulate jasmonates, not only in local but also distal (systemic) leaves, These trigger the expression of pathogenesis-related (PR) genes. The products of these genes are PR proteins, which resemble the digestive enzymes in carnivorous plants. This similarity led the researchers to investigate whether botanical carnivory had evolved from plant defence mechanisms. 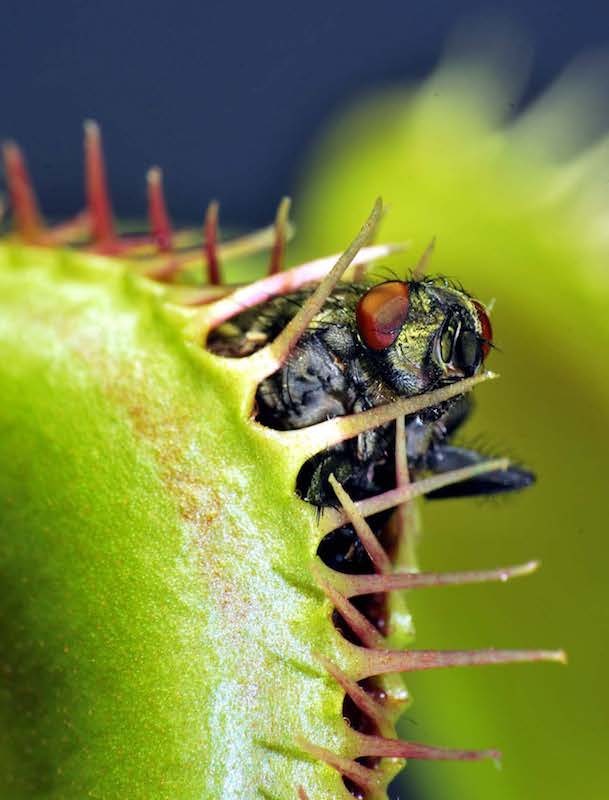 Andrej Pavlovič and colleagues tested Venus flytrap plants, to see if they could differentiate wounding (a typical activator of plant defence) and mechanical stimulation (a typical activator of carnivorous response). Human brains can decode the electrical signals coming from receptors – we can tell if our skin was caressed or wounded. But it’s all the same to the Venus flytrap. Wounding triggers the same action potentials as a visit from a potential meal. Both wounding and prey capture also trigger the accumulation of jasmonic acid and trigger secretion of the same digestive enzymes. Read the full post on the New Phyt blog.